I have put Selous up before....so will let this run. Jane- wrong nationality? You mean Selous, the well-known Londoner??? 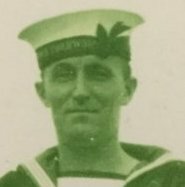 I believe it is Commander E L Rhoades, captain of the gunboat HMS Gwendolen(? ), who defeated the German gunboat Hermann Von Wissman commanded by his alleged drinking buddy Captain Berndt, on Lake Nyasa (now Lake Malawi) on the 13/8/1914. This in some quarters has been referred to as the first naval engagement of the war, albeit there are reports the Wissmann was on dry land under going repairs, and that Berndt had not been informed that a state of war existed between Britain and Germany. Wiki it saith: "From 1914 she was commanded by Captain Edmund Rhoades who attacked the Hermann von Wissman, the vessel of his friend and former drinking partner Captain Berndt, by surprise, with Berndt having been unaware that war had started." I found the picture somewhere on the web but forgot to make a note. In the public domain as far as I know. In fact the siege of Toulon was a rich seam. It was there that Bonaparte first made his celebrated, "Mon chien n'a pas de nez" gag. He may have been short, but he had perfect comic timing. Oh come on UG. Dont keep me in suspense!! At Toulon his punchline was, "Il ne peut pas - il n'a pas de nez!". The gag was received with a bewildered and embarrassed silence. This was the jokes's first outing, remember. He honed it and by the time of the Italian campaign he had it down. The joke was later picked up by that other master of the one-liner, Arthur Askey, who polished it to the form we know today. But it's Boney's gag. "Music is the voice that tells us that the human race is greater than it knows." C'est un blag profond. Un blag merveilleuse. "Comment est-il sentant? Terrible!! So who is this chap, and what is his connection to Arthur Askey? 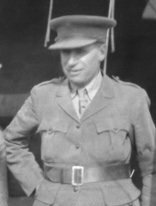 By the look on his face, the first British army officer to make for the exit after Arthur's first "joke" at an ENSA concert. I know this thread is for people to identify a person that the poster knows the identity of but if you fancy a variation on that theme this thread might be of interest. EDIT: Sorry, I see from the post in Soldiers that you already have this information. Yes, and if you read that thread you will see that I have ruled out H-N and thus narrowed down to the other 3. Is he a vicar or something similar? That's actor Simon Cadell's great-uncle Francis of the A&SH, although I wouldn't have known that if I hadn't been following assorted trails about Simon a while back. Francis Campbell Boileau Cadell (1883-1937), one of the Scottish Colourist painters. 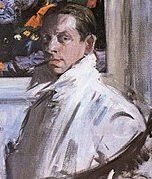 https://en.wikipedia.org/wiki/Francis_Cadell_(artist) (source of the picture). He served in the ranks of 9 Royal Scots, then commissioned in the A&SH. 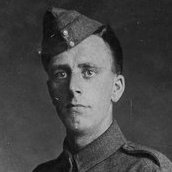 Brother of actor Jean Cadell and great uncle of actors Simon Cadell and Selina Cadell. (I had rather a good clue about a holiday camp lined up. I came across him quite a few years ago when I saw a play about the Scottish Colourists. At the time I didn't pick up that he had been commissioned. Can't quite make him out. Is it Ellis Ashmead-Bartlett? Bartlett and Askey both have strong connections to the name Murdoch? Not EA-B: but you're practically there. Is it actually K. Murdoch then?